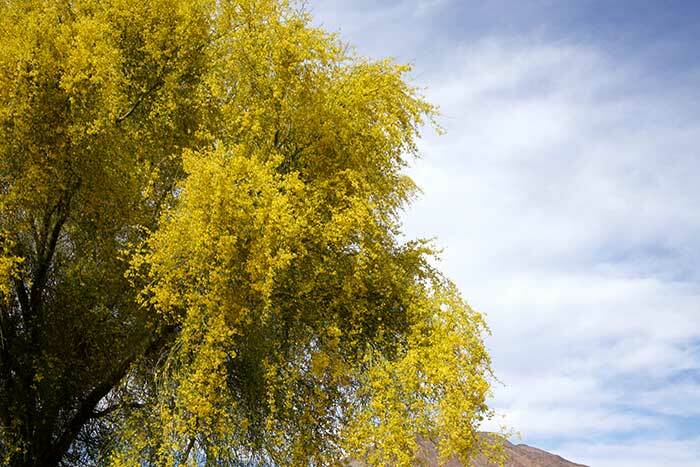 Palo Verde Trees commonly occur in the Southwest: the foothill, yellow or littleleaf palo verde (Parkinsonia aculeata ) and the blue palo verde (Parkinsonia florida). Palo verde  Spanish for green wood or stick  alludes to the plant’s greenish branches and trunk. Common names refer to location, bark tints or comparative leaf size. Both species are spiny, green, multi-trunked, deciduous trees. Foothill palo verdes only reach about 20 feet in height and have more yellowish bark and duller yellow/white flowers. Blue palo verdes top out at 40 feet. Their twigs and young branches are bluish-green, as are the leaves, which are larger than the foothill variety. Both have twice pinnate leaves (leaves with two stems and opposing leaflets on each stem), with the foothill species having more abundant leaves growing on longer stems. Pods contain from one to eight seeds, with one being far more common than eight. The foothill species pods have narrow waists between the seeds, which are lentil sized. Blue palo verde seeds are slightly larger and flatter, with thicker, harder shells. The blue palo verde species grows primarily in washes. It requires more water than the foothill species, which grows more commonly in the uplands. The blue species occurs principally in fine soils, and the foothills species, in coarser soils. Foothill palo verdes often live for over 100 years and may reach 400 years. In contrast, blue palo verdes grow faster and die sooner, rarely reaching the century mark. 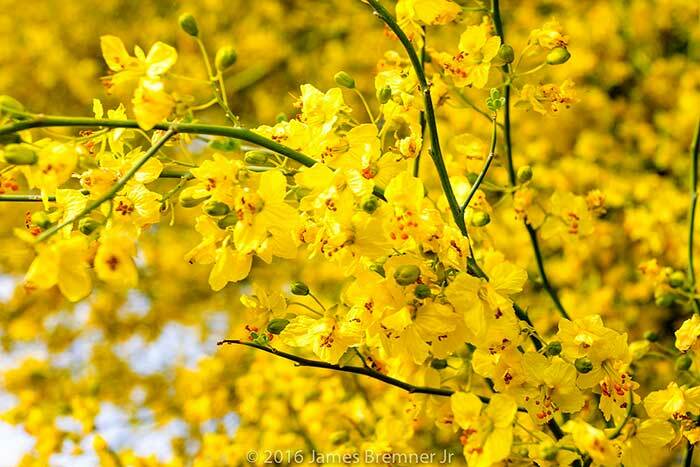 During their short flowering seasons, both species are clothed with thousands of five-petaled yellow blossoms. They attract numerous pollinators, including beetles, flies and social and solitary bees. The trees can photosynthesize through their green bark, an important adaptation for a tree that drops its leaves during the warm season and in response to fall cooling. Palo verdes also drop stems and branches to combat drought. Palo verdes serve as nurse plants for saguaro cacti by providing a canopy  in effect, a microhabitat  which offers warmth in winter and shade in summer. The slower-growing, longer-lived cactus will eventually replace its one-time protector. Bighorn sheep, mule deer, feral burros and jackrabbits as well as other small mammals browse palo verdes. Numerous birds forage, perch and/or nest in the abundant branches. Blue palo verde occurs across the Sonoran desert, growing from central and southwestern Arizona into southeastern California, and south into western Sonora, Mexico. Disjunct  that is, separated  populations occur in northern Sinaloa and Baja, California. Foothills palo verde grows through central and southwestern Arizona and extends south into Sonora, Mexico, and Baja, California. Notes: Irish botanist Thomas Coulter was the first trained botanist to collect these plants. He obtained specimens near Hermosillo, Sonora in 1830. Larvae of palo verde root borers (Derobrachus geminatus) feed on these trees. They grow up to five inches in length. Adult are up to three and one half inches long with long antennae.